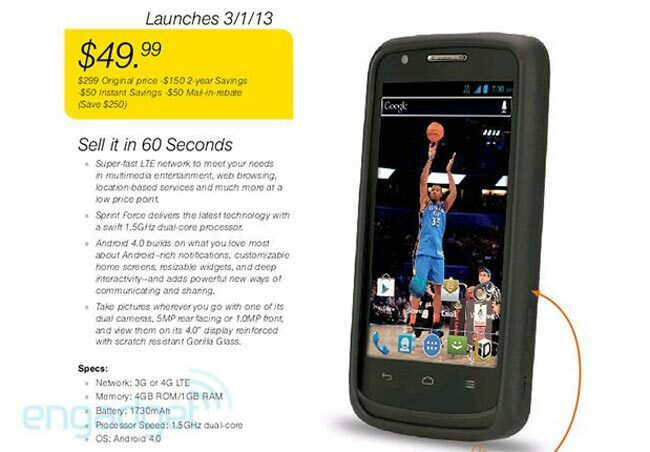 Details have been leaked of a new Android smartphone that is headed to US mobile carrier Sprint, the Sprint Force LTE, which you can see in the photo below, and the device is headed to Sprint on the 1st of March. The Sprint Force LTE will come with a 4 inch display and will feature Android 4.0 Ice Cream Sandwich, processing will be provided by a dual core 1.5GHz processor, although there are no details on exactly which processor it will be. Other specifications on the Sprint Force LTE include front and rear facing cameras, with a 1 megapixel camera up front and a 5 megapixel rear facing camera, it will also come with 4GB of RAM and a 1,730mAh battery and will retail for $49.99.